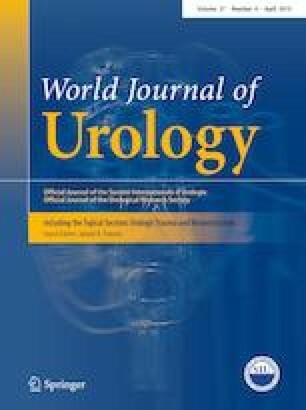 The endoscopic stone treatment step 1 (EST s1) protocol has been developed after 2 years of collaborative work between different European Association of Urology (EAU) sections. In this study, we added construct validity evidence to the EST s1 curriculum. The EST-s1 curriculum includes four standardized tasks: flexible cystoscopy, rigid cystoscopy, semi-rigid URS and flexible URS. Validation was performed during the annual 2016 EUREP meeting in Prague. 124 participants provided information on their endoscopic logbook and carried out these 4 tasks during a DVD recorded session. Recordings were anonymized and blindly assessed independently by five proctors. Inter-rater reliability was checked on a sample of five videos by the calculation of intra-class correlation coefficient. Task-specific clinical background of participants was correlated with their personal performance on the simulator. Breakpoint analysis was used to define the minimum number of performed cases, to be considered “proficient”. “Proficient” and “Non-proficient” groups were compared for construct validity assessment. Likert scale-based questionnaires were used to test content and to comment on when the EST-s1 exams should be undertaken within the residency program. 124 participants (105 final-year residents and 19 faculty members) took part in this study. The breakpoint analysis showed a significant change in performance curve at 36, 41, 67 and 206 s, respectively, corresponding to 30, 60, 25 and 120 clinical cases for each of the 4 tasks. EST-s1 was scored as a valid training tool, correctly representing the procedures performed in each task. Experts felt that this curriculum is best used during the third year of residency training. Our validation study successfully demonstrated correlation between clinical expertise and EST-s1 tasks, adding construct validity evidence to it. Our work also demonstrates the successful collaboration established within various EAU sections. The members of ESU Training Group are listed in Acknowledgements. The novel EST s1 training curriculum is a valid tool to certify proficient mastery of the basic endoscopic skills. In this study we validated the novel basic training curriculum for Endoscopic Stone Treatment, called EST-s1, developed after 2 years of collaborative work inside the EAU. We found that our curriculum is valid to certify proficiency of the basic endoscopic skills. The protocol is now established as a standard tool to certify proficiency of the basic endoscopic skills in Europe, with potential of worldwide adoption in the future. Our study successfully added face and construct validity to EST-s1 tasks. The protocol is now established as a standard tool to certify proficiency of the basic endoscopic skills in Europe, with potential of worldwide adoption in the future. ESU Training Group members are: Ben Van Cleynenbreugel, Domenico Veneziano, Ali Gozen, Bhaskar Somani. All their institutions are already in the paper as they are also listed as authors. DV: project development, data Collection, and manuscript writing. AP: data collection. SP: data collection. TT: data collection. GK: data collection. GT: statistics. BVC: data collection. AG: data collection. AB: data collection. JP: data collection. KS: data collection. EL: data collection. KA: data collection. BKS: project development and manuscript writing.